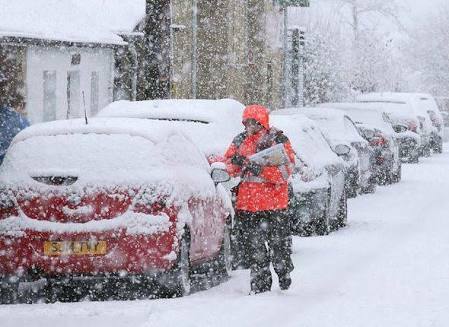 Severe weather warnings for snow have been issued as a "mini Beast from the East" is expected to hit the UK. The Met Office has forecast snow across England on Saturday and temperatures could drop by 10C. Amber warnings for snow and ice - meaning a potential risk to life - are in place for parts of England from Saturday afternoon. Some trans-Pennine roads are expected to be "severely affected" in the early hours of the day. Highways England has issued an amber "be prepared" alert for the North which could run until 05:00 GMT on Saturday morning, with up to 10cm of snow expected on higher routes. Drivers have been advised to avoid some roads including parts of the M62 (junctions 21 to 25), A66 and A628, the M1 between Rotherham and Garforth, the M606 near Bradford and the M621 near Leeds.